"We are currently using expEDIum Medical Billing software from iTech. We are absolutely convinced that this particular software is the very best in the market for our requirements. The superb after sales service that is rendered by the company staff is second to none...."
A clinic with 10 providers that used an outsourced billing company to process claims. They provided inpatient consulting for over 10 hospitals and submitted professional claims for their services. The billing company was using a legacy billing software. Consistent denial/rejection/error claims follow up. iTech migrated this client from their legacy system to expEDIum Medical Billing solution along with the patient and claims data. iTech's eMB addressed the main issues faced by the clinic. In addition to the above issues, the solution has a built claim validation and a claim scrubber that ensure only error free claims are sent to the clearinghouse and the payers. The solution streamlined their billing operation by standardizing the processes and also made the claim life cycle more transparent. The biller was able to increase the productivity and streamline the billing operation. The billing operations was more streamlined with more automation and lesser paper handling with respect to book keeping, invoices etc.,. The providers were able to access their data using secure provider logons and clinic administrator had a variety of reports available to her at any time. This installation used Availity, OfficeAlly as clearinghouses and also Payspan health to receive ERAs from specific payers. 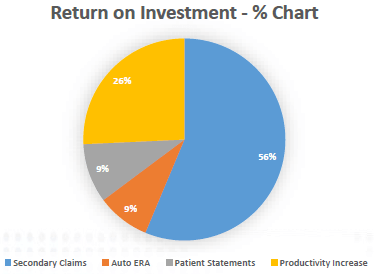 The overall productivity improved resulting in better claim visibility and denial/rejections processing. 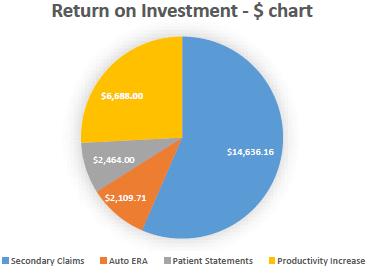 This installation receives Electronic ERAs (that are auto posted) for about 65% of the claims sent and the remaining 35% on paper EOBs (that are manually posted). The 65% auto posting saved almost a person month of data entry time per year. The secondary collection went up from 8.8% (of total charges) to 11% due to increased visibility resulting in additional $14,600 collection per yearsince they started using our solution.